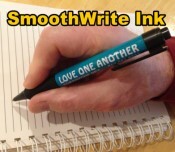 This pen will make a statement for Love. It uses a new formula ink for smooth writing with a large barrel cushion grip. Reminder of John 15 vs. 12.